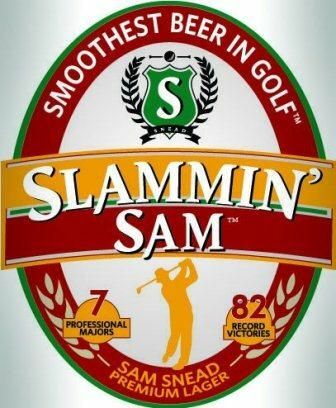 (PINEHURST, NC) – Slammin’ Sam Beer Company announces the introduction of Slammin’ Sam™, a craft-brewed premium American lager inspired by the late Sam Snead, one of golf’s greatest gentlemen and champions. Debuting this week at The Greenbrier Resort in conjunction with the centennial of Snead’s birth, Slammin’ Sam features a refreshing taste with an exceptionally balanced finish that makes it the Smoothest Beer in Golf. It showcases a proprietary recipe developed by Ray Klimovitz, recipient of the 2011 Distinguished Life Service Award from the Master Brewers Association of the Americas. Possessor of a prodigious, self-taught swing, Snead captured seven major championships and an all-time record 82 PGA Tour titles during a professional career spanning from 1934 to 1987. A player on seven and captain of three U.S. Ryder Cup teams, his countless honors include winning PGA Player of the Year (1949) and the Vardon Trophy (1938, ’49, ’50 and ‘55). Snead, who passed away in 2002 at age 89, is also a member of the West Virginia Golf Hall of Fame and World Golf Hall of Fame. For more information: http://www.Facebook.com/SlamminSamBeer or @SlamminSamBeer. A new venture, Slammin’ Sam Beer Company holds an exclusive, worldwide license with the estate of Sam Snead, one of golf’s greatest gentlemen and champions. The company’s first introduction, Slammin’ Sam™, is a craft-brewed premium American lager with a refreshing taste and exceptionally balanced finish. Inspired by the legendary, self-taught swing of the PGA Tour’s all-time wins leader, it has been created to be the Smoothest Beer in Golf™. Developed using a proprietary recipe developed by Ray Klimovitz, recipient of the 2011 Distinguished Life Service Award from the Master Brewers Association of the Americas, Slammin’ Sam is produced by the industry’s most respected contract breweries. Initially available at The Greenbrier Resort – which Snead called his professional home for more than 60 years – Slammin’ Sam will also be offered at other renowned resorts, as well as golf courses, restaurants, bars and everywhere beer is sold. Targeting golfers and all active lifestyle consumers, Slammin’ Sam is sold in cans, bottles, and kegs. The line’s packaging and marketing will depict famous images of Snead from the 1950’s and ‘60’s.